In 2019, Bitcoin’s price has risen from $3,778 to $5,287. The New York Department of Financial Services issued a BitLicense to Bitstamp. 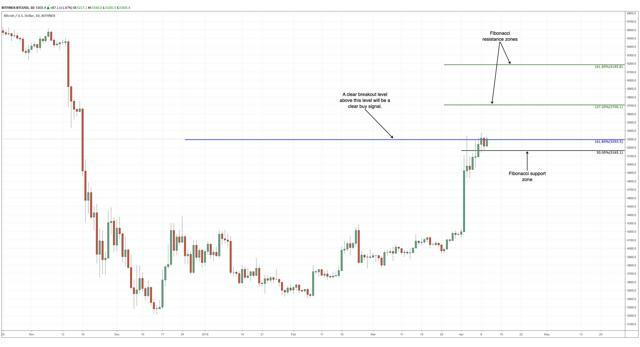 Bitcoin to rise in the range of $5,706.1 and $6,185.8. From the beginning of 2019, Bitcoin (BTC-USD) has been trading in an upwards channel that has resulted in numerous traders having a nice bulge in their wallet. However, the big question now is, will there be another sizeable move up, or can we expect a price decline. Hence, to answer this question, I will look at the fundamental news affecting the cryptocurrency while also analyzing the charts using technical analysis tools. This is because I expect Bitcoin to have a price rise in the range of $5,706.1 and $6,185.8. Bitcoin's luck seems to be changing in 2019 as the cryptocurrency has had a gradual upwards move, which has resulted in it rising from a low of $3,778 to the current price of $5,287. Thus, the big question now is why is this price rise occurring. The answer to this is Bitcoin accumulation. This is because, in 2019, several Bitcoin whales have once again begun purchasing the cryptocurrency. What this means is that some of the original owners of Bitcoin who had liquidated around the $20,000 mark have started to buy back into the asset. This, I believe, is a very positive sign and is one of the reasons I expect an upward price move in the cryptocurrency. The buyback will create a sizable amount of optimism, which will give Bitcoin a shove in the right direction. One of the reasons I expect a rise in Bitcoin's value is due to the positivity surrounding the cryptocurrency market in 2019. There has been a lot of infrastructure development in the market which has helped raise the optimism level. An example of this is the launch of a crypto platform by Fidelity Investments. This type of news may not trigger a bull run in the cryptocurrency market but will surely act as an excellent catalyst. Hence, as more positive news trickles in, I expect Bitcoin's price to reach higher levels. The growth of cryptocurrencies in emerging markets may not help raise Bitcoin's price as of now but will ensure that the cryptocurrency has a positive trajectory in the long term. New research suggests that Bitcoin's trading volume in emerging markets now exceeds that of the developed world. Therefore, this indicates that Bitcoin's price will rise steadily over the years. Emerging markets are deemed to be the future drivers of the global economy. Thus, an asset class that is backed by the emerging markets will undoubtedly rise in the long term. The cryptocurrency market is not well liked by experts such as Warren Buffett and similarly-aged billionaires. However, the market has captured the interest of younger billionaires such as Elon Musk, and I believe this will significantly benefit the asset class in the long run. A younger investor will pay more consideration to an asset class that is receiving attention from a famous leader with whom they can relate. Hence, I believe this may not cause a rally in the short term but will ensure that the asset class has a stable growth trajectory in the years to come. One of the reasons I expect a rise in Bitcoin's value is due to the New York Department of Financial Services issuing a BitLicense to Bitstamp. This license will allow Bitstamp to provide cryptocurrency trading services in the United States. The reason I chose to highlight this is because I believe this is a step in the right direction for the asset class. It will allow cryptocurrencies to further solidify their position in the American market. The firm had applied for the license in June 2015. Hence, the approval of the license after all these years is a positive sign as it shows the government is finally starting to soften its stance on cryptocurrencies. The cryptocurrency's daily chart indicates that, in the coming days, Bitcoin will be trading in a sideways pattern after which I expect it to have a robust bullish ascent. The cryptocurrency has formed a 'Bullish Harami' candle pattern which indicates to investors that the bearish rally has stalled. Moreover, it signals to investors that the bulls have once again taken control of the market. Furthermore, Bitcoin has taken support from the 50% Fibonacci support level at $5,165.1. This confirms that a bullish continuation is on the cards as the 50% Fibonacci support level is a candle support zone. On the price target front, I expect Bitcoin to rise in the range of 127.2% and 161.8% Fibonacci resistance levels. The 127.2% Fibonacci resistance level is at $5,706.1, while the 161.8% Fibonacci resistance level is at $6,185.8. However, I would advise traders to go long on Bitcoin once it has had a close above the prior 161.8% Fibonacci resistance level at $5,293.5. On the indicator facet, the short-term RSI has had a sharp upturn after being in slight descent for the prior five sessions. This supports my notion that Bitcoin will be rising in the range of 127.2% and 161.8% Fibonacci resistance levels. Overall, I am leaning towards the bulls pushing the value of Bitcoin in the range of $5,706.1 and $6,185.8. This is driven by the fact that the technicals and fundamentals support an ascent in the cryptocurrency's value until that point. However, whichever way you decide to trade, make sure you utilize trailing stops, as this will aid in capital preservation. Disclosure: I/we have no positions in any stocks mentioned, but may initiate a long position in BTC-USD over the next 72 hours. I wrote this article myself, and it expresses my own opinions. I am not receiving compensation for it (other than from Seeking Alpha). I have no business relationship with any company whose stock is mentioned in this article.